KNAF Talent First car racing talent Rinus VeeKay and Juncos Racing have extended their successful partnership that started in early 2018 by another year. 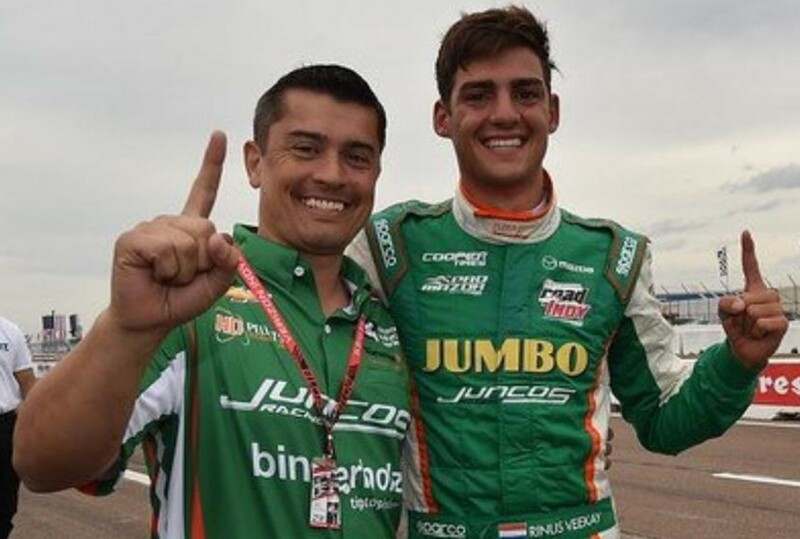 After claiming the title for Juncos Racing in the 2018 Pro Mazda Championship Presented by Cooper Tires, the 18-year-old driver from Hoofddorp in the Netherlands has now signed a contract with team owner Ricardo Juncos to go for the title in the 2019 Indy Lights championship, the highest level of the Road to Indy Presented by Cooper Tires. “I’m really looking forward to cooperating and being successful again with Ricardo Juncos and his team,” said a happy VeeKay. After claiming the title of vice champion in the 2017 Cooper Tires USF2000 Championship, KNAF Talent First car racing talent Rinus VeeKay stepped up to the next level this season, the Pro Mazda category. For this campaign VeeKay joined Juncos Racing early 2018 and it was the start of a very successful partnership. In his maiden season in the Pro Mazda Championship Presented by Cooper Tires, the then still 17-year-old racing talent from Hoofddorp in the Netherlands won seven out of sixteen races and claimed the title in commanding style, being the first champion in the history of the new and much faster PM-18 generation Pro Mazda cars. This opened the door for VeeKay to go for his next goal and also the highest level of the Road to Indy Presented by Cooper Tires, the Indy Lights Presented by Cooper Tires. In the last few weeks VeeKay tested with the Indy Lights car and after looking into all options, the young Dutchman made his choice for the 2019 season. VeeKay and Juncos Racing will extend their partnership in 2019 and will go for the title in the Indy Lights championship. “I really feel at home with Juncos Racing and I think I can improve my performance and get better with this team, and that is extremely important for my next goal, the IndyCar Series. It’s also great to see that the team work extremely hard for me. Last season they proved that, after a setback, they can come back better than ever before and that they do everything they can to be successful. The 2015 and 2017 Indy Lights titles prove that. I’m really looking forward to work together with Ricardo and his team again and to being successful together. I would also like to thank Jumbo, La Place and KNAF Talent First for their ongoing support. I’m also really proud to represent Mazda in the Indy Lights next season as their last scholarship winner,” said a very happy VeeKay. VeeKay’s choice for Juncos Racing also got full support from his mentor and two-time Indy 500 winner Arie Luyendyk. Ricardo Juncos, owner of Juncos Racing, is also happy to sign his successful 2018 driver again: “We are thrilled to have Rinus continue with our team for the 2019 Indy Lights season after an extremely successful year in Pro Mazda. Rinus has proved that he is ready for the next level of the Road to Indy through his work ethic both on and off the track. The level of training he goes through and the time he commits to developing himself as a driver shows the dedication and passion he has to take his career to the next level. We developed a great relationship throughout the 2018 season and look forward to carrying that momentum into next year. I would like to thank Rinus, his family, and sponsors for their commitment to Juncos Racing." The Indy Lights category is the highest level of the Road to Indy Presented by Cooper Tires and the final step before entering the highly regarded IndyCar Series. The Indy Lights Presented by Cooper Tires is a 10-event, 18-race schedule which includes street course venues, road courses and ovals. The 2.5-mile Indianapolis Motor Speedway is also part of the series as the Indy Lights will race in the same week as the world famous Indy 500. This race, the Indy Lights Freedom 100 is the most prestigious race of the year. The 2019 Indy Lights season kicks off in St. Petersburg, Florida, on March 8th-10th. The Indy Lights series use a Dallara IL-15 chassis with a 2-liter 450HP turbocharged Mazda engine. The winner of the championship is awarded a scholarship valued at USD 1.1 million toward the IndyCar Series with three guaranteed races including the Indianapolis 500. By claiming the Pro Mazda (starting next season called Indy Pro 2000 Series) title in 2018, VeeKay won the Mazda scholarship prize worth almost USD 800,000 to progress into the Indy Lights Presented by Cooper Tires. Rinus VeeKay is supported by Jumbo, La Place and the Dutch KNAF Talent First program.